Now in full color, Ugly's Electrical Safety and NFPA 70E, 2018 Edition is the market leading reference for electrical safety. 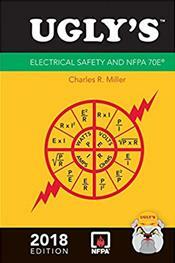 Based on NFPA 70E 2018, this new edition summarizes current OSHA regulations as well as the National Electrical Code.. Revised and expanded coverage of protective strategies with a greater emphasis on the hierarchy of preventive and protective risk control methods. Revised and renumbered tables used to estimate likelihood of an arc-flash incident. New table used for the selection of arc-rated clothing and other PPE. Outlines the new eight-step procedure for establishing and verifying an electrically safe work condition. Updated requirements include annual lockout/tagout program and procedure audit with new retraining intervals. Designed for electricians, engineers, maintenance workers, inspectors, instructors, and apprentices, this invaluable pocket-sized resource provides fast access to the most commonly referenced sections of the latest NFPA 70E and related safety standards.